The dwarf planets, unlike the terrestrial and gas giant planets, are in more than one region of the solar system. Ceres is in the asteroid belt, Pluto's orbit is mostly outside that of Neptune, but partly inside: it is very eccentric in shape. The others are in the trans-Neptune region. No space probes have visited any of the dwarf planets. This will change if NASA's Dawn and New Horizons missions reach Ceres and Pluto, respectively, as planned in 2015. Dawn also orbited and observed another not sphere-like but still potential dwarf planet, Vesta, in 2011. Ceres was found by Guiseppe Piazzi on January 1, 1801. 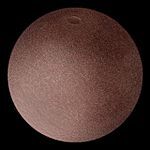 Classified as a dwarf planet on September 13, 2006. Dwarf planet Facts for Kids. Kiddle Encyclopedia.